A cease-fire agreement between Iraq's leading Sunni insurgent group and al-Qaeda is bad news for the U.S. military, which has been trying hard to drive a wedge between them. A statement by the Islamic Army that appeared on a jihadist website Wednesday says "an agreement has been reached [with] al-Qaeda in Iraq, leading to an immediate cessation of all military operations between the two sides." The statement added that the two groups would form a "judicial committee" to address their differences. It may be several days before statement is authenticated, but it appears to confirm what some Islamic Army field commanders have conveyed to TIME this week: that despite the recent violence between them, the two groups can still cooperate in operations against U.S. forces. "We disagree on some things, but we agree on the important ones," one commander said. "The most important is that it's our common duty to fight the Americans." He added that the leaders of both groups see the current "surge" of U.S. troops in and around Baghdad as an opportunity rather than a threat. "The enemy has come to us," he said, "and instead of fighting each other, we should take advantage of their vulnerability." In the past week, al-Qaeda fighters have exchanged heavy fire with Sunni insurgents  including some from the Islamic Army  in several Baghdad neighborhoods. American and Iraqi officials had hoped that this represented an irreparable rift between homegrown insurgents and foreign jihadis. The Islamic Army is Iraq's largest homegrown insurgent group, and is built around a core of officers and soldiers from Saddam Hussein's elite Republican Guards. 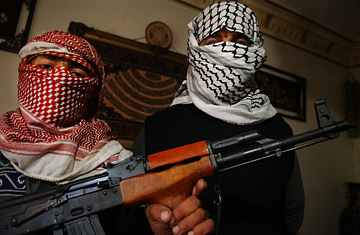 Despite its name, it started out in the spring of 2003 as a secular, nationalist resistance; but it quickly began working closely with al-Qaeda, especially in the volatile Anbar province, west of Baghdad. Perhaps because of this association, by late 2005 the Islamic Army had morphed into a religious organization. Its fighters now style themselves as religious warriors, and its propaganda is laced with Koranic verses. Even so, the Islamic Army never adopted al-Qaeda's extremist views. The Iraqi group refused to sign on to al-Qaeda's so-called "Islamic State," and it openly criticized foreign jihadis for their campaign of bombings against civilian targets. Also, the Islamic Army sees itself as the natural leader of the fight against the U.S., and resented al-Qaeda's attempt to dictate the agenda. In some areas, fighters from the two sides disagreed on chain-of-command issues, and on the distribution of resources. The recent fighting in Baghdad may have been an escalation of long-simmering conflicts over turf. The Islamic Army's statement doesn't list the terms of the cease-fire, but insurgent commanders have said they want al-Qaeda to stop targeting civilians  especially Sunnis. Whatever the terms of the truce, if the two groups are now willing to put the clashes of recent weeks behind them and reunite to fight U.S. and Iraqi government forces, the months ahead will be very bloody indeed.